My first ever read-a-thon kicked off to a great start; I did almost nothing else but read. Are you still reading? Keep it up girl if you are! 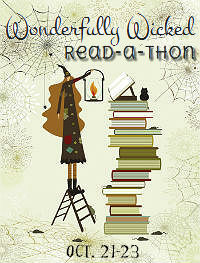 I'm starting Dewey's read-a-thon tomorrow and am very excited! I just went out and bought food supplies. I don't plan on leaving the house for the next 48 hours! Yay reading! I'll do like you and read a lot of horror too! Mandy - I did keep reading till I couldn't, because my eyes were too swollen and I needed to get some sleep. Now I'm reading again. Hope you enjoy your read-a-thon as much as I'm enjoying this! !